Lexington, Virginia Hotel's Guests Enjoy Extended StaysTourists take weeks to explore the history and natural wonders near our hotel's property in Lexington, VA. The hotel is outside the historic downtown area, where you can spend a day steeped in the Civil War's past or revel in the present with fresh, eclectic dining and shopping destinations.The Holiday Inn Express Hotel Lexington features deluxe extended stay accommodations for those here for business or relocating to the area. In addition, we're convenient to Mohawk Industries, Modine Manufacturing, Washington & Lee University and Virginia Military Institute's Center for Leadership and Ethics. The 24-hour business center and free Wi-Fi access in every room keep our hotel's guests productive.In Lexington, VA, take a narrated carriage tour through college campuses and distinguished residential neighborhoods, and you'll see why Hollywood producers came here to depict 19th-century America in Somersby and Gods and Generals. 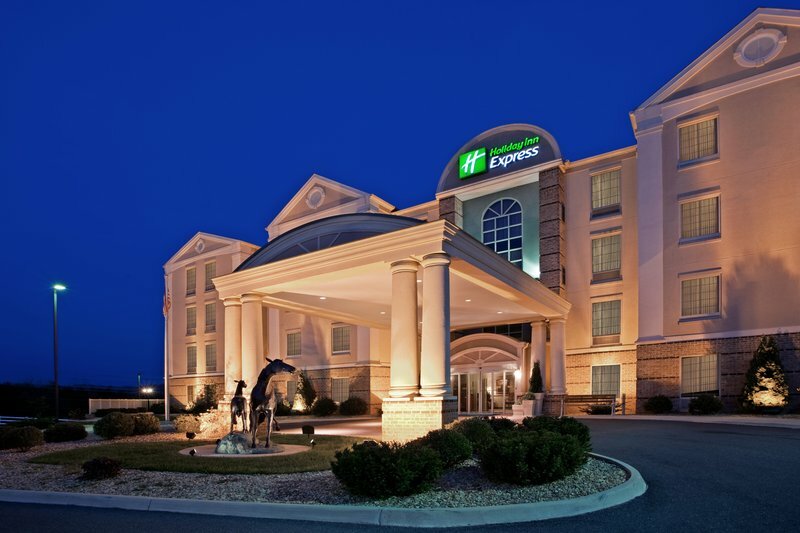 When you've had enough of yesteryear, visit Natural Bridge, hike or drive through Goshen Pass or make plans for dinner and a show in downtown Lexington, VA.Enjoy the hotel lobby's unique Shenandoah Valley decor before visiting the complimentary, hot Express Start Breakfast Bar to prepare for your day. Experience Lexington's charm at the friendliest hotel in southwest Virginia as you bask on our sunny back patio, absorbing rugged mountain views. Spacious meeting room with natural light and beautiful gallery style artwork. Convenient access to parking for loading and unloading equipment and catering. Accommodates people with disabilies and provides counter space with beautiful dispaly cabinetry. "Seal" was the University of Virginia's beloved dog mascot, and was buried with honors (and a headstone) in the campus cemetery. A commercial cave where a scary mascot pixie beckons the unwary, and an above-ground museum of animated store window displays.